Most people who have watched a 3D movie on a big screen, will agree that it is a pretty cool technology. When it comes to 3D imaging for spine navigation to assist with complex spine surgeries, physicians and patients would both agree that this technology is a welcome addition to the operating room as well. Spine navigation intra-operative guidance up close. Click image to watch video on computer assisted spine surgery technology. Video and Image used courtesy Stryker® Corporation. All rights reserved. Computer assisted technology such as the Stryker® Spine Navigation System at University Orthopedics has been aiding orthopedic surgeons and neurosurgeons in many types of surgeries, such as knee or hip replacement and brain surgery, for years. The Spine Navigation System is an improvement on the fluoroscope, which provides a two-dimensional view during a surgical procedure. 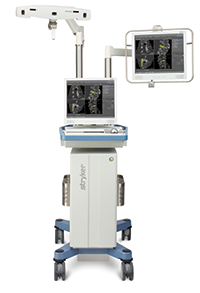 The Stryker Spine Navigation System offers doctors a comprehensive, fluid 3-D picture of the exact surgical site in the patient — an exact roadmap of the patient’s spine. Dr. Mark Palumbo, Dr. Craig Eberson and Dr. Phillip Lucas at the University Orthopedics Spine Center in Rhode Island now apply the power of navigation technology to spine surgery. 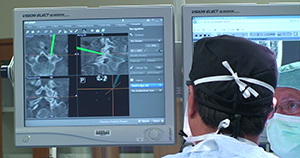 The Spine Navigation System places the spine surgeons at University Orthopedics at the forefront of computer assisted surgery for spine in the nation. The University Orthopedics Spine Center already receives referrals from across Southern New England. These patients with complex spinal problems travel great distances to University Orthopedics in search of pain relief and for help in getting their lives back. This 3D surgery technology allows spine surgeons like Dr. Palumbo, Dr. Eberson and Dr. Lucas to perform complex spine surgeries with improved safety, speed and precision. Before surgery, the patient will have a CT scan. The images are then downloaded to the navigation computer. Software is used to develop a virtual, 3D model of the spine. 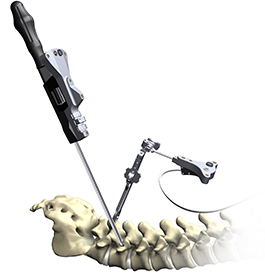 The spine surgeon inserts a special Stryker probe into the patient through a small incision. The probe transmits a signal back to the navigation system. The software uses the patients CT Scan with information from the Stryker probe to transmit a real-time view of where the instruments are throughout the procedure. Helps reduce the radiation exposure of both the patient and medical staff as it eliminates the need for multiple X-ray images. Offers the surgeon a complete picture of patient anatomy prior to surgery. This allows the surgeon to better prepare for surgery and can result in shorter surgery times. Surgeons have real-time knowledge of instruments and implant position during surgery. Reduces potential for incorrect implant placement during surgery. The use of image-guidance technology in all types of spinal surgery is rapidly growing. Spine fusion surgeries that help relieve pain resulting from injury, degenerative disc disease, spinal curvatures or arthritis are the most common navigated surgeries. After spine fusion surgeries, many patients can have significant reduction in pain and a successful return to an active lifestyle. The University Orthopedics Spine Center is pleased to incorporate the Spine Navigation System to aid in complex spine surgeries to treat disc herniations, spinal stenosis, spinal tumors, trauma and scoliosis.